The Philadelphia Eagles beat the New England Patriots 41-33 on Sunday in Super Bowl LII in Minnesota and are bringing the Lombardi Trophy back to Broad Street. The Eagles put on a spectacular and record setting show on Sunday. Eagles Quarterback Nick Foles threw for 373 yards and three touchdowns. Foles also caught a touchdown pass thrown by Trey Burton in a trick play that was attempted by Tom Brady and the Patriots earlier in the game. Brandon Graham had an amazing strip on Tom Brady, causing a fumble, which was picked up by Derek Barnett. The recovered fumble led to a field goal by Jake Elliot giving the Eagles an 8-point lead. Elliot set the record twice in the game for longest field goal made by a rookie in the Super Bowl. His first record setting field goal was at 41 yards, and then topped it with a 46-yard field goal. The game winning, 11-yard touchdown was caught by Zach Ertz with 2:21 left to go. The Patriots had one last ditch effort to win, throwing a Hail Mary pass which ended up being deflected in the end zone. 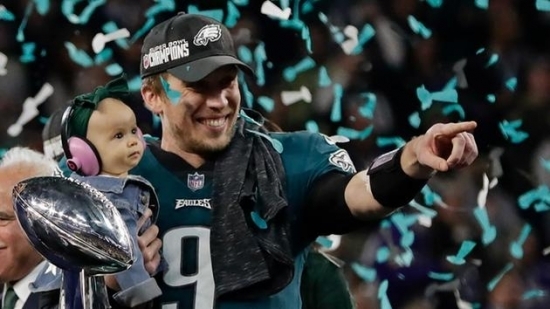 Nick Foles received the Super Bowl MVP award for his amazing performance in the game. This is the first Super Bowl win for the Philadelphia Eagles, their last appearance in the Super Bowl was in 2005 where they also played the Patriots. With the Eagles solidifying their first Super Bowl win; many fans took to the city streets to celebrate the win. Although a majority of the celebration was nice and respectful, some fans got a bit too rowdy. There were reports of an overturned car as well as fans jumping on and breaking the awning outside of the Ritz Carlton. Fans were also able to climb the poles in the city despite being previously greased up with hydraulic fluid. Some poles in the city have also been torn down in Center City as well. Commissioner Richard Ross stated that there were several arrests made during the night. Although the city has been busy and crowded with the celebration of the Eagles Super Bowl win, The Philadelphia School District announced they will remain opened on Monday. However, school officials say that with a super bowl parade in the future, they will determine whether schools will be closed or not. The school district stated: "We will make any potential announcements, on Monday, regarding a parade should the Eagles win the Super Bowl but until then E A G L E S - EAGLES!!" UPDATE: All School District of Philadelphia schools and administrative offices will be closed on Thursday. All Archdiocesan high schools and parochial elementary schools in Philadelphia and the suburbs will also be closed. The Eagles beat the Patriots 41-33 in Super Bowl LII. Today, Clear and sunny with a high of 35 degrees in Center City.